At Flooring America of Oregon, our choice of carpet styles, textures, and color combinations are only restricted by your imagination. We're dedicated to our goal of offering high-quality carpeting at the best prices around. We can provide incredible deals and substantial savings that you won't find anywhere else with the buying power of our Flooring America network of stores for carpet. Portland area homeowners only have a difficult time when it comes to deciding from our many fantastic choices. Carpet provides any room with texture and warmth. In addition to its visual appeal, carpets can help reduce utility bills by providing your home with insulation. Our durable and stylish carpet styles are sure to work in any home and fit any budget. Whether you are looking for new Tigressa carpet in your living room or frieze carpet in your family room, you'll find what you need at Flooring America of Oregon. With a variety of patterns and styles, our experts can help you choose the carpet you've always imagined for a price you won't believe. From Karastan carpet for your living room to a new floor of soft shag carpet, we have what you need to get inspired today at Flooring America of Oregon. We are proud to feature a multitude of carpet styles, textures, and designs as distinctive as your own personal taste. We provide a free in-home measuring and estimate program at your convenience. In addition, our Flooring America Five-Star Warranty carpet rating program makes it easier than ever to find the right carpet for your home in the Portland, OR area. Our wide range of carpet rankings and explanations were specifically designed to alleviate the technical aspect of selecting your new carpet. We provide the area's finest choice of carpet in the manufacturer brands you trust. 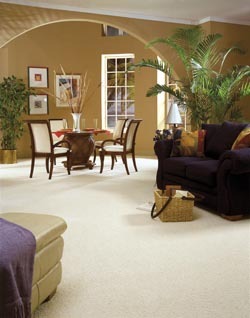 Select Flooring America's wide-catalog-range of carpet to uncover your ideal look from manufacturers like Mohawk carpet. We also have a variety of Shaw carpets in our showroom, and carry selections other industry leaders like Beauliel carpet. From Stainmaster carpet to industry leaders like Shaw, Mohawk, and Downs, carpet this good can only come from Flooring America of Oregon in Oregon City, OR! We're proud to serve customers throughout Clackamas County, Oregon, including the cities of Oregon City, West Linn, Lake Oswego, and Portland.